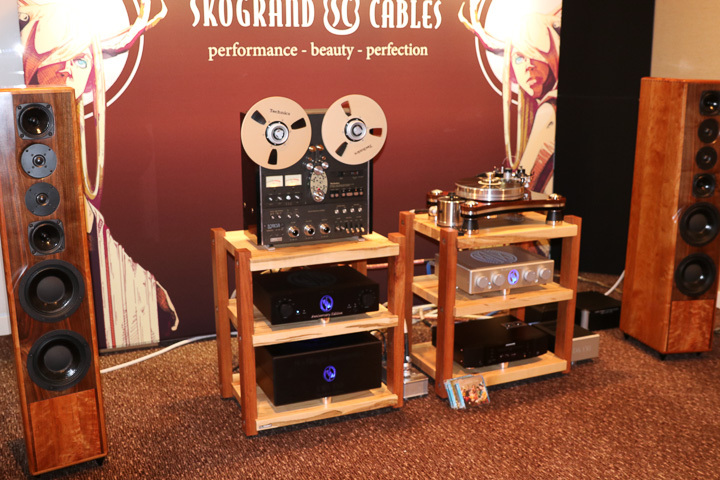 The Axpona (Audio Expo of North America) show in Rosemont Illinois has become the largest Audio show in the US. Occupying 8 floors and 140 rooms the show dominates the Westin O’Hare for a three day show the third weekend in April every spring. HiFi+ brought the team together from the US and the UK to bring the show to you in our collective coverage. My assignment was amplifiers and digital front ends with an emphasis on new gear and best sounding rooms. Three days is not enough to cover everything! Some prices were not posted and full rooms make questions a challenge. If I missed something, my apologies. The pen was flying and my camera is now cooling off after the frenzy. The first room up was the Scaena/PS Audio room feature a full PS audio rig and the new Scaena tower speaker featuring the full force sound of their $116,000 USD flagships coming out of their new $56,000 USD speakers. 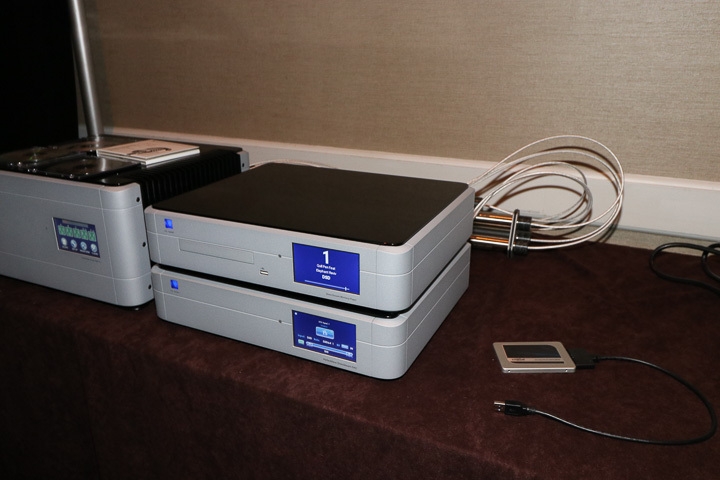 The Digital front end consisted of the PS Audio DirectStream DAC ($6,000 USD) and the new DirectStream Memory Player ($6,000 USD) which connects to the DAC via an I2S Connection. The output fed into the PS Audio BHK Pre-Amp ($6,000 USD) and then to the PS Audio BHK 300 Monoblock amplifiers. Gear was plugged into PS Audio P10 Power Regenerators ($5,000 USD) The sound was full and musical in the very large room. It was a satisfying start to the show! 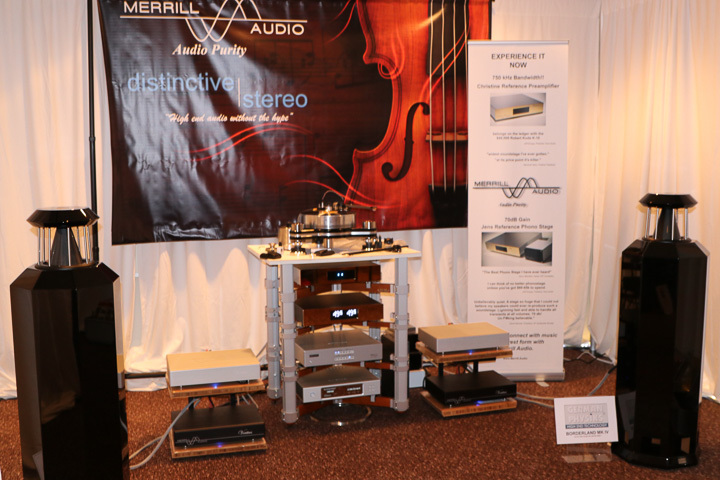 Merrill Audio was showing their Christine reference Pre-amp ($13,000), Jens Reference Phono Pre ($15,449), Veritas Monoblock Class D amps ($12,000 per pair) and their ANAP XLR ($1,049) interconnects and ANAP speaker cables ($1,049). 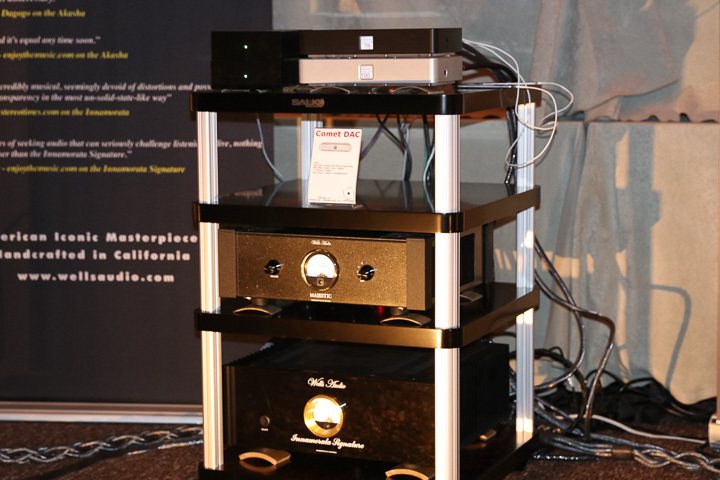 Digital front end was an ESS Labs DAC2x ($15,500) and Aurender N10 music server ($8,500 with 8TB). 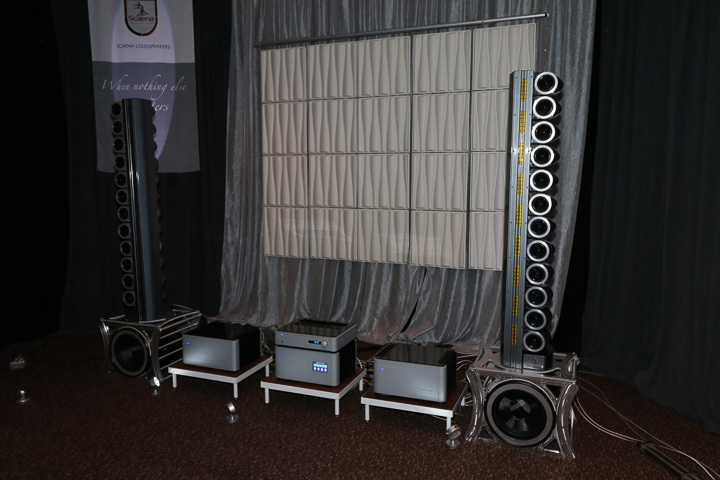 Music was delivered by the German Physiks Borderland MK IV speakers ($36,500). I am a fan of Merrill amps. Anyone who has preconceived notions of harsh and Class-D need to leave them at the door. This system was clear and tuneful. The Aurender N10 is a digital champion for music serving. Wells Audio was showing their Majestic integrated amp ($3,499) and Innamorata Signature 150wpc at 8 Ohms amp ($15,000) with Salk Speakers Exotica 3’s ($12,999) and Exogal Comet DAC. Sound was precise and full. The Innamorata is an extraordinary amp with a black background and very low noise floor. 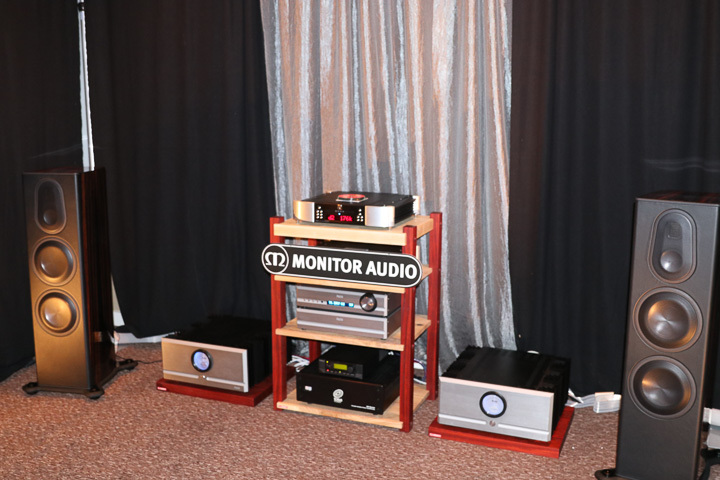 Monitor Audio brought in Pass Labs XA 160 Mono’s and XP 20 Pre-amp along with a Simaudio Moon 650D CD/DAC to pair with their excellent PL300 II speakers. It was a simple but elegant system.